Okay, Dancing With the Stars and So You Think You Can Dance? are on hiatus and American Idol is just starting its new season and is weeks away from getting interesting. So if you want to see some first-rate talent from those shows – and see it live – then take yourself to the El Portal Theatre in North Hollywood and see Ballroom With a Twist. This is a dazzling show with first-rate dancing and singing. I certainly did not expect to just get lost in each musical number the way I did but each was like an individual masterpiece, put together with an eclectic collection of music and dancing and lighting. Ballroom was conceived and choreographed by DWTS pro Louis van Amstel who is sharing hosting duties on some nights with Niecy Nash and others with Jane Seymour, both of whom were his celebrity partners on past seasons of the ABC show. Van Amstel, a five-time Dancing With the Stars pro who was paired with Margaret Cho during the fall season, wisely chose some of his fellow pros from the ABC show to hit the road with him for this energetic production. 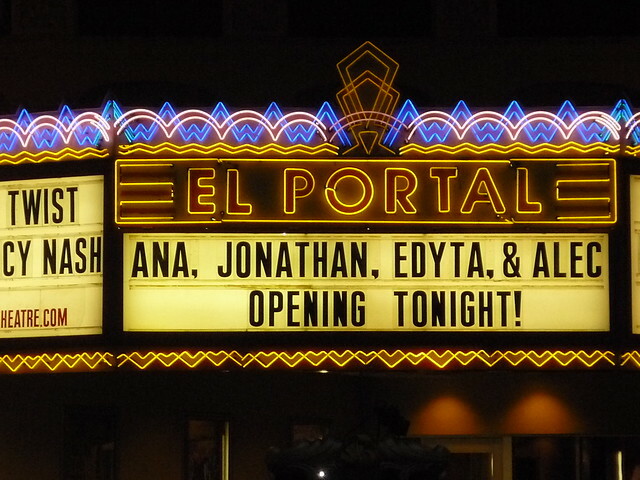 The DWTS dancers joining him at the El Portal are Edyta Sliwinska, Alec Mazo, Jonathan Roberts and Anna Trebunskaya. They are among the more familiar faces in the production since they have done multiple seasons of DWTS. Also featured are So You Think You Cab Dance? finalists Randi Lynn Evans, Gev Manoukian and Jonathan Platero. Watching them do just about every form of dance imaginable to terrific lighting and music would be one thing. But what elevated Ballroom for me, and gave it some real heart and soul, were the stupendous vocal performances from former American Idol finalists David Hernandez and Gina Glockston. They are such charismatic performers and it makes you realize that talented singers often do not get the chance to show what they can do. Hernandez (pictured left) is particularly superb during the Imagine and Walking in Memphis numbers. I was astounded by van Amstel’s energy – especially since I had seen him on Good Morning America earlier in the day and knew that he had then flown across the country from New York City to Los Angeles and gone straight into preparations for the performance. Among the celebrities on hand for opening night were another one of van Amstel’s former DWTS parters Lisa Rinna and DWTS alum Lorenzo Lamas as well as singer Freda Payne, comedienne Judy Tenuta, Broadway star Rachel York (looking very gorgeous and very pregnant) and actresses Julie Newmar, Alison Arngrim, Dee Wallace, Romi Dames, Kate Linder and Ilene Graff. There was buzz that Paula Abdul would be attending but she was a no-show. But Paula was not missed. There was more than enough dancing talent in the theater! Ballroom plays at the El Portal Theatre through Feb. 13. Jane Seymour will appear on Feb. 4, 5 and 6.